You, The Inspector, have been trying to solve the case of the eerie abduction of young Amy Haven for several years, but were suspended for tampering with evidence to get the primary suspect convicted, the vagabond known as “Mr. Bones”. Now, you return to Dowerton for a last, paranormal search to find Amy Haven, and to learn the secret of the Dark Fall. Dowerton; a once picturesque rural village, hidden away in the English countryside. Like many villages, it has been tainted by modernity and economic failure; sallow youths hide in the shadows, losing their minds to chemical slime, while others simply disappear into the woods, never to be seen again. The elders of the village hide indoors, all too aware of the darkness that lurks outside. The once grand Train Station was the heart of the community, but only the very brave, or the very stupid, now approach the place. Adjoining the station is the Victorian Station Hotel. Once a haven for weary travelers and adulterous lovers, the hotel is now in ruins. Rot, decay and time are tearing this place to pieces. This, is where the Dark Fall flourishes. You must watch your step, and never turn your back on the darkness.... Something evil, unknowable and hungry is hiding in the darkness of these old buildings. It wants your soul; to feed upon, devour and torture. Can you make the ghosts your ally so you can battle against the darkness that lurks in that long forgotten, abandoned Hotel? Explore a derelict train station & hotel, abandoned since World War 2. A new game engine allows full exploration and movement. Physically interact with the eerie setting, to really ‘feel’ the place. Use light as your weapon and ally, to fight the darkness. A hauntingly creepy stereo score, to chill, alarm and horrify. Explore the memories of the dead, in their own ‘nightmares’. Discover the true identity, and power behind, the Dark Fall itself. 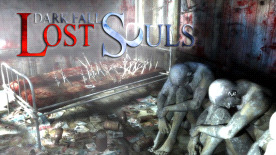 Dark Fall: Lost Souls © 2010 Darkling Room. Developed by Darkling Room. Licensed exclusively worldwide to and published by Iceberg Interactive B.V. All brands, product names, and logos are trademarks or registered trademarks of their respective owners. All rights reserved. Made in Europe.